Purple Colored Double Vinyl in Gatefold Sleeve. In honor of the 25th anniversary of the iconic film The Bodyguard, Legacy Recordings, is celebrating its legacy with the release of a brand new collection of Whitney Houston live and studio recordings entitled "I Wish You Love: More From The Bodyguard". 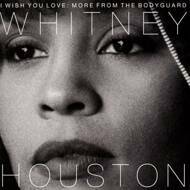 "I Wish You Love: More From The Bodyguard" is an essential new Whitney Houston collection bringing together a variety of live and studio recordings from The Bodyguard (many previously unreleased or unavailable) including an alternate mix of "I Will Always Love You," which features a spoken word intro of Whitney as Rachel Marron, an A Capella version of "Jesus Loves Me," which has never been heard before and a live recording from The Bodyguard World Tour 1993-1995 of "Run To You," which Whitney rarely performed. Also included are film and live versions of I Will Always Love You," "I Have Nothing," "Queen of The Night" and more.